Spice up your gift-giving with our Hot Box! An array of spicy goodies for snacking and dipping will keep the most ardent heat lover satisfied. 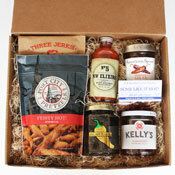 Spicy pretzels and a filet mignon beef jerky with a burst of cayenne are great for munching. Whip up a batch of our Some Like it Hot Dip Mix and scoop up with a chip, or dip into the award-winning Dried Chile Salsa from American Spoon Foods. Spoon our ever-popular Candied Jalapenos or the savory Habanero Pepper Jelly over cream cheese and you have an instant hors d'oeuvre with a little heat. And for those who just can't get enough, splash a dash of Hott Jolokia ghost pepper hot sauce over just about anything you can think of. This sauce takes heat and flavor to the next level. 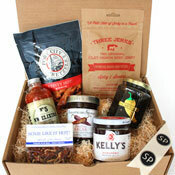 Gift-boxed and ready to give to anyone who likes snacks that pack a punch! Port City Pretzels - Feisty Hot Pretzels: Irresistible seasoned pretzel sticks with a kick from cayenne. Three Jerks Jerky - Memphis Brand BBQ Jerky: Filet Mignon beef jerky rubbed with a proprietary Memphis spice blend; a jerky that is a little fiery, yet refined. To Market To Market - Some Like it Hot Dip Mix: Chipotle at its best! Makes a wonderful cheeseball as well as a chip or vegetable dip when mixed with mayonnaise & sour cream. Third Coast Gifts - Jalapeno Gold Candied Jalapenos: The ultimate candied jalapeno with a slow, steady burn. Northwest Elixirs - Hott Jolokia: Award-winning hot sauce combines ghost peppers with rum, pineapple, red wine vinegar, and spices. 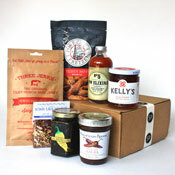 Kelly's Jelly - Habanero Pepper Jelly: Adds a balanced touch of sweet & heat to appetizers, meats, cheeses and more.